Thursday, Sept. 13, 1888 Cooler morn, with quite a frost. Pleasant day, & Mercury 73° P.M. Others as well think & having Mr Wedgwood's "Turnout" Ellery took Clara with him when out in borders of town on business most A.M. Charlotte busy at home, & had callers, I was called when Mrs Townsend & Mrs Geo- Deane were in. As well self & spending day much same, only at Addie Bartletts of errand A. M. Friday 14 Not as cool, but cloudy with few sprinkles & quite shower during last half P.M. About same with our folks, & busy at usual duties most of day, but Charlotte was at "Reading Club" at Mrs Armstrongs, where coffee party combined. 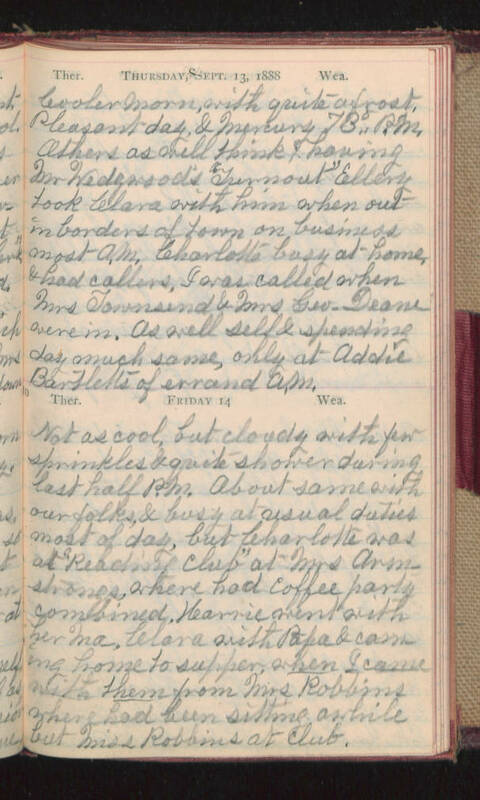 Karrie went with her Ma, Clara with Papa & coming home to supper, when I came with them from Mrs Robbins where had been sitting awhile but Miss Robbins at club.